In the evaluation of artificial joint disorders, synovial fluid analysis can become a very efficient diagnostic tool. This chapter explains the role of synovial fluid cytological analysis in diagnosing prosthetic joint infection (PJI). Recommended cutoff values for diagnosing PJI for leukocyte count are 1,700 cells/μL and for neutrophils 65 %. Considering those cutoff values for diagnosing PJI, the specificity is very high, exceeding 90 %, which means that negative cytological result of synovial fluid analysis indicates absence of infection. 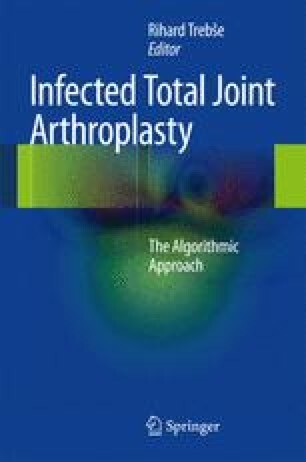 The results are comparable to intraoperative tissue cultures and histopathology, which are frequently used as reference standard diagnostic markers in diagnosing prosthetic joint infection.